An email buddy told me that lately I have not written anything about religion. Frankly, I have been continually feeling and thinking that I should comment more about this subject since religion in general, as in other countries/societies, continue to have a major impact on how we Filipinos live and operate in our homeland/society. Hereunder is an unfinished piece about Filipino religiosity, written by our hero, Dr. Jose Rizal. I am posting it here without much comments except to say that I find it quite entertaining; but seriously speaking, all that Rizal have written about then widely exist among us now at home and abroad; reflecting the truisms he observed, of our continued ignorance and/or shallow understanding of the meaning of Christianity. Many, if not most, of us Filipino faithful - clergymen or not , are still in the medieval stage of Catholic Christianity (bolstered by our blending it with our cultural/tribal beliefs in animism/superstitions, etc.) while the rest of Christianity has moved on. PS. 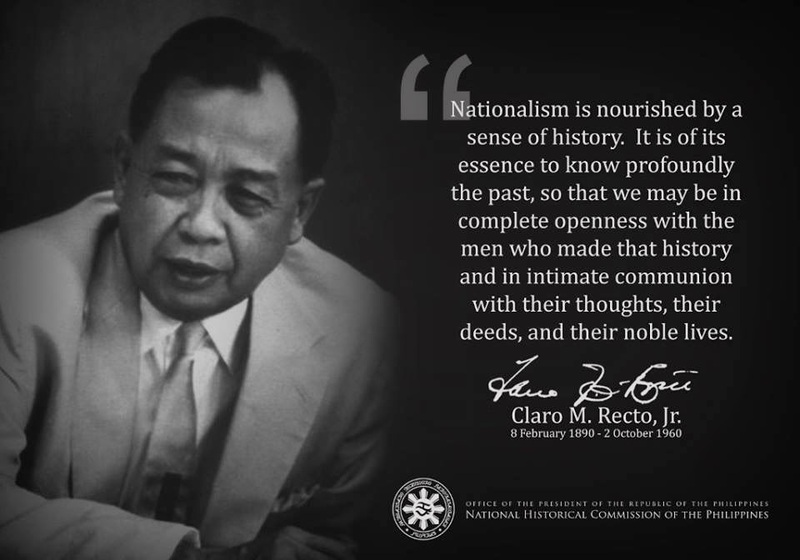 It suddenly crossed my mind that we Filipinos suffer from a paucity of intellectuals, we oftentimes cite just Rizal and at best, few others (our former colonial masters have suppressed and banished/exiled our more radical thinkers - historically, a common practice by Spain and America) . Our public and private(Catholic) educational institutions have perpetuated this condition to the extent that such a state-of-affairs creates the mythical deification of Rizal and adoption of his limited approach to true nationhood, in terms of socio-political changes and economic independence. Note: A fragment of an essay by Rizal –Estado de religiosidad de los pueblos en Filipinas – translated by Dr. Encarnación Alzona. The common man then who did not understand the language saw mystery in everything; and because of his ignorance, either he deceived himself or encouraged the impostures of others. - Cesare Cantu, History of the World, "On Religions in General"
All those who have dealt with the Philippines in their writings or in conversations affirm one thing: the religiosity, or better, the religious fervor of the people. However, they are not agreed in their evaluation. Some have discovered a religious spirit pronouncedly Catholic, a piety worthy of the first centuries; others a superstitious fanaticism in which there is nothing great or sublime, the characteristics of Christianity; others, ignorance or refined hypocrisy; and still others, a materialistic and superficial religion devoid of any fundamental beliefs or true virtues. Such a great divergence of opinion can only be explained by the difference in their individual ideas, the degree of their education, and the nature of the prism through which they see the circumstances and the facts. In fact, some through similarity of conviction and principles praise in others what they themselves practice and profess; others, of diametrically opposed doctrines censure those who do not think as they do. Possessing a pessimistic spirit they judge the generality of men by specific cases, though not exceptional but still uncommon. The others consider only the external manifestations of the objects that absorb their attention without looking deeply into their internal qualities. The most enthusiastic panegyrics [complements] and the most sarcastic and bitter criticisms alternate with compassionate disdain or mocking praise. It is not unusual to hear one who once exalted his faith and morality afterwards laugh and despise what he had so highly praised. One who would pretend to know the state of morality of this people through the perusal of books published by writers who are candid or prejudicial or the various travel accounts will gain a strange idea, more or less exaggerated, according to the source of his information. We who have no other purpose in writing but to be useful to our country and its people; we who don’t wish to flatter, because they will discover the lie and repay us with justified contempt; we who believe that our writings will be read only by those to whom they are dedicated and consequently our criticisms will not tend to discredit or affect the opinion that foreigners already hold of us; and above all, we who have always counted ourselves among the sons of the people because we have lived as they did, breathed the same air as they, and shared their defects and mistakes, we hope in dealing with this subject to expose the truth such as it is and as we have seen it and such as we judge it at present from afar, free consequently from its powerful influence. The subject seems easy at first glance, but looking at it well, it is very difficult and rough. At first one promises himself to say the whole naked truth: later he will be obliged to dress and adorn it to make it acceptable; afterwards he will have to hide it to put in its place a manikin, which, if it is not a lie, ought to resemble it very closely. Until better times come, the pen must bow to circumstances. Thus, without limiting ourselves to specific facts and provinces we are going to speak in general, without alluding to or blaming anyone. And as religious beliefs and laws, their consequence, accompany man everywhere and in every moment of his life modifying his character, his instincts, his passions and even his manner of thinking, in spite of the fact that many think the contrary, we are going to study the religious spirit in all phases of the life of the Filipino, private and public, in his festivals and his entertainments as well as when he mourns and weeps at last – in short from his birth to his death. We will divide then the present work into two parts: one dealing with internal worship and the other with external religious ceremonies. By internal worship we understand the ideas, the beliefs, about the divinity of the saints and future life. By external religious ceremonies we mean all the visible manifestations of the soul, all the symbols, all the homage rendering to superior beings through material demonstrations in conformity with religious beliefs. Let us now take up internal worship, or rather, the beliefs, but bearing in mind that we are referring solely to the Catholics, who form a large majority in the country, as the object of our study is the generality of the people without pretending to embrace all of them. Let us examine in the first place the basis of a religion: the idea of a divinity. Let us find out the idea not of the educated man, who is ready initiated in the mysteries, so to speak, but of the common man, despised being in the age of ignorance and barbarism, feared and respected in stormy and turbulent days and the object of anxiety in civilized and cultured countries. Let us look into his concept of God or the Supreme Being whom he worships, inasmuch as on the greater or less purity of this knowledge depends the degree of greatness of religion. Ordinarily all the blotches and defects of any doctrine have their origin in a tiny shadow or blemish in the divine idea, in the same manner as a slight cloud over the solar disk envelops in shadow all the objects that it covers and dominates everything from its from its lofty height. We know very well that nobody on earth has an exact and perfect idea of God, which explains the inaccuracy and imperfection of all the religions devised or reformed by men. However, we ought not for this reason despair of ever knowing it. Man is not expected to do more than his strength would allow. The inventor does not blame the machine if it does not produce more than what it can or should. Just as our understanding is important and limited so also are our concepts. Therefore, the clarity of our idea of the Creator will depend on the degree of our ignorance or the development of our intellectual faculties. Having stated these brief considerations let us describe fully the notion of God held by the majority of the inhabitants of the Philippines and we should not be surprised if we discover some irregularities. They firmly believe without the least doubt in the existence of one God, the Creator, excessively omnipotent, before whose presence metaphysical impossibilities disappear; more revengeful and just than mild and merciful because of the continuous threats, punishments, and tortures. They believed, as we have said, in the unity of God and the Trinity, they confess the deep mystery of God and generally they kneel down instead of inquiring and examining their beliefs, though at times a Brother of the Third Order or some other order, or senior sacristan would pretend to explain it with more or less vulgar examples or some singular interpretation. We have never heard as it had occurred to anyone to inquire about the origin of God or about His purpose. They have a full understanding of eternity. The Filipino person is an obedient and humble believer. If his reason encounters an obstacle or else an anomaly with which he disagrees, he will not seek a hypothesis to explain it; on the contrary, he will smother his scruples or silent protests in the fire of his faith or in his great confidence in the mysterious. As if to soften and assuage somewhat this terrible idea that they hold of God, there is the poetic and tender one of the Virgin. However, one must distinguish two things: the Virgin as the Mother of the Savior, and the different images that represent her. That tender, merciful compassionate, mediator of sinners resides in heaven; she is a loving mother, indulgent, and without equal. The Virgin of the images or rather the different representations of the Virgin, images that are more or less miraculous, are generally regarded in another way. They easily accede to the prayers and offerings and other acts of piety of their devotees who wear their scapular or their insignia. They attend them at the hour of their death and are a powerful safeguard of all those who in life dedicated themselves to their cult. Just as they unfailingly aid those who fulfill their promises so they punish in a more or less notable manner those who fail to fulfill their vows of whatever kind. These images attain such influence on the imagination of the common man that they eclipse what they represent, consequently becoming not mere images but genuine and distinct entities. He sees in them not the symbol of the Mother of God but a powerful demigoddess to whom are attributed usually passions and tastes, each one having her defenders and partisans. Any statue, picture, or painting of Our Lady of the Rosary would be venerated in a different manner from that of Our Lady of Carmel and various statues or paintings of this one would be appreciated in different ways according to whether they are more miraculous than the others. A devotee of the Virgin of Antipolo, for example, would use half of his fortune and perhaps more for the purpose of giving glory and fame to her sanctuary while he would not light candle before the Virgin of Raphael, if this has not given signs of the most significant manner. In short, it is not the idea but the symbol that they venerate and worship; it is not the Mother of God but a statue or a painting that at one time represented a being pious and tender above all; now it has become a true existence. If you would say to one of those simple and fervent devotees that the mass for the Virgin of Antipolo can also be said in honor of the Lady of Sorrow, without losing anything, he will call you simply and fervently a heretic or at least a bad Christian. The same happens to the saints. Among them are saints for stolen objects, like Saint Anthony of Padua; for eye diseases, like St. Lucia; for the plague, like St. Roque; for crops, like St Isidore; for the rains, like St John the Baptist; or the locusts, like St. Augustine, and others. Even for giving fertility and curing diseases there is St. Pascual Bailon who is venerated in the town of Obando. So great are their faith and confidence to these saints that almost never do they ask God for the object of their desires. I don’t know why, whenever they find a saint dedicated to a specialization. What happens to the images of the Virgin happens also to those of the saints. The image of St. Anthony of Padua of such and such a church or barrio is more miraculous than that of St. Anthony of Padua of this church or that house, because for one candle lighted in his honor a stolen article was returned to Pedro which did not happen to Juan with the saint elsewhere. And what a strange thing! The most miraculous images are the worst made, the oldest or the ones that inspire greatest terror or respect, now for being black or brown, now for his stern features. Similarly, the old statues of the Greek gods were considered more powerful and terrible than the beautiful, elegant ones sculptured by Phidias or Praxiteles. Without exception all believe that we have a soul, which is immortal. No one doubts it and so rooted is this belief that it is the only one accepted by all. This soul can go out of the places to which God has assigned him and wander around places and persons that pleased him or in which he is interested. Some towns, or rather many country people, believe that those who are not Christian have no soul and so they look upon the Chinese as entirely different beings. As an inevitable consequence of the immortality of the soul is the belief in another life that begins in the tomb and never ends. It is presumed that before the arrival of the Spaniards and of course the Catholic religion in those Islands, their inhabitants had no idea of either hell or purgatory, though they already, though they already believed in the existence of the soul. However, we don’t know if they considered it immortal. We think so, inasmuch as in all their dialects is found the word which means soul, but not purgatory or hell. With respect to their idea of heaven, purgatory, and hell, they did not differ in any way from the other Catholics. They considered heaven the abode of the abode of the angels and the blessed, purgatory, of those who had to atone for very minor sins or purge themselves of the stain that past and more serious sins leave behind, and hell, of all bad Catholics and all who do not belong to the Catholic religion regardless of whether they are more just than Job and more reclusive than was St. Paul. Their idea of these terrible places is the same as in the time of Dante. Of heaven, however, their ideas were different and varied according to the one who looks at it and analyzes it. There are those who believe it to be the country of the cockpit, of the theatre, and mangoes; of eternal music and bright lights; of melodious songs and delightful dances; in short, everyone imagines a heaven according to his tastes and aspirations. Nevertheless, there’s never lacking some Voltairian [Referring to a Filipino who, as did the 18th century French writer and philosopher, François Marie Arouet Voltaire, questions the existence of orthodox religion -- rly] countryman who speaks of these things half-mockingly as if he does not believe in them. “I don’t want to go to heaven,” said one, “it’s so high that if I slip and fall to earth I would be dashed to pieces. Neither do I want to go to hell for they tell me it’s very bad there, though I don’t believe it entirely; were it true, many would have come back.” “I almost like hell,” said another gambler, “All the rich go there, all the gamblers, and all the pretty and gay women; however, all the innocent go to heaven, as well as the eleven thousand virgins…” The existence of good and bad angels is admitted without discussion or even hesitation, though until the present, the devout have seen only the bad ones, for the good ones seem to be scarce. The devils are the cause of all evil and appear before men in all guises. The idea of virtue, which should be pure, sublime, and universal, assumes here another aspect, entirely curious. It is not the humble and resigned virtue of the Hebrews who respond to their misfortune and miseries with chants and exaggeratedly mournful lamentations; it is not the stoical and fierce virtue of the Spartans who sacrifice for the material well-being of the mother country the most beautiful sentiments and the most tender natural impulses; it is not the beautiful and profound virtue of the Athenians who paid no attention to ingratitude or poverty but only to their duty prescribed by the mother country and their laws; neither is it the cruel and severe virtue and equally great and terrible virtue of the Romans for whom there was no other god but the grandeur and preponderance of their country; neither is it Christian virtue, the only true, humanitarian, universal, humbly heroic, which the Son of God bequeathed to men as a symbol of peace, as an efficacious panacea for the ills not of the community, people, or race, but of all mankind. The people, of defective or scanty education, without any idea or exact knowledge of their religion, naturally judge things according to their education and ability and are many times deceived by the surface or appearance rather than by their fundamental merit. To them a just and good Christian is one who frequents the church, who attends the most processions, who lights the most candles, and gives luxurious dresses to the images, without taking into account whether the money used in these works (pious, yes, but not at all necessary) has been acquired at the cost of the hunger and tears of many unfortunate men. What? Does it not happen that those who had amassed modest fortunes, enriching themselves through frauds and deceit, at the hour of their death, when they no longer have the need of the amassed treasure, or tormented by terrible remorse, to silence their conscience and enjoy heaven, give to the church the product of their avarice and infamy die peacefully believing that they have fulfilled all their duties and acted according to the will of God? And will the infinite Purity accept what an honorable man would disdain to touch? The widow’s mite, the miserable mite, was pleasing to the eyes of Jesus Christ because it came from a pure heart governed by a clean and tranquil conscience! What a difference there is between the humble alms, the most simple expression of piety, and the ostentatious bequests of pompous gifts, a vain investment! Let it not be believed, however, that we indict such actions, sometimes the children of a good desire and sincere faith, no; doubtless their motives are not always reprehensible; but there are so many miseries to be remedied, so many tears to be wiped out, and above all, there is a scarcity of beneficent hands for the truly unfortunate. But returning to what we were saying, we will add that the idea of the true and solid virtue is very little or not known at all among the people. It’s rare to find one who sees farther and who longs for more. Quite often their intelligence cannot grasp the true meaning of Christian doctrines. They adapt themselves to the character and imitate if not their virtues, at least their defects. The continuous fasting, confessions, or membership in one or various confraternities are usually considered the most meritorious acts of life. To do good to one’s fellowmen, to make a sacrifice for the happiness of others, to tell the truth even to one’s detriment, to look upon all as brothers are acts that go unnoticed, either because true virtue is modest and simple or because it is unknown to men. And so it happens to the idea of sin. To mix or eat meat on days of abstinence, to break a fast or something of the kind, is generally considered a sin graver still than to lie which hurts and injures, than backbiting or the insult to misfortune and poverty. You can hurt even unjustly the self-love of an unfortunate man; you can rob the orphan and the widow, or take away the honor of a man who has no other patrimony; you can call him the most injurious and basest names; you can make him pay with bitter tears his sad fate and your enviable situation; in short, even maltreat him, slap him, and kill his mortal life. You can do all this and even more, and no one will say that you are a bad Christian so long as you hear mass, you confess, you take communion, and attend all processions, praying all day and fasting on fast days marked on the calendar. The commandments of the Church are more respected than the Law of God; formulas of faith dominate more than ideas, because pomp and ceremonies impress the common man more than principles and substance. Many persons violate divine laws because of the facility with which sins are erased, and to be again reconciled with the Creator through a confession or at least through an act of contrition, and the assurance of being purged of one’s sin in less time than is necessary to commit it. The candor or rather the ignorance of many people tends to perpetuate these lamentable popular beliefs that not only do they mislead many minds but they also greatly discredit in the eyes of foreigners the holy doctrines of the Catholic religion, thus exposing to ridicule many sublime and evangelical teachings. These are the most common ideas which prevail among the people. Perhaps there may be some who do not think or believe like the rest; but the truth is that the religious beliefs of the common man can be condensed as we have briefly stated. The brevity of this article does not permit us to go into more details or go deeper into the question. …. [Note: a portion of the writing is lost] Let’s go now to the consideration of the external cult. But as this embracers numerous subjects, we shall leave untouched the ceremonies, usages, and customs that are not unique or resemble those of other countries, confining ourselves only to those which are of interest either for their singularity or for any other quality that makes them notable. With respect to prayers the Filipino people can be said to be truly religious. From the time a Filipino rises from his bed to the time he returns to it to rest from the wearisome day all his actions alternate with prayers and devotions. Perhaps they are the only Catholic people who still preserve the primitive traditions. The ringing of the church bells announce the hours of prayer and retreat; communication with the Creator is frequent and repeated, though the object of their devotions is the Virgin and the saints. However, many pray in their native tongue, but as the majority of the novenae are strongly recommended to obtain certain objects and wishes, the faithful are forced to recite these prayers instead of the simple and pure prayers taught by Jesus Christ, thus giving rise to instances of such very bad pronunciation of phrases and words that would make laugh even the very images to whom these religious acts are dedicated. There’s something worthy of note in them: there’s a rigid measure for the “Our Fathers,” “Ave Marias," and “Gloria Patris,” a fixed number, a certain whimsical combination that the common man follows and scrupulously observes, as if God would scorn the prayer of an unfortunate man for being one “Our Father” more or one “Gloria Patri” less. The same thing happens to the novenae. They have to be exactly nine days though they are not recited devoutly – always the form before the substance. As we have already noted, the cult of the Virgin and of the saints is more widespread than that of God because of the belief that the graces could be more easily obtained through the intercession of mediators. These novenae are dedicated to all the images of the Virgin and all the saints known for their specialties, for this or that miracle. Some have such faith in certain prayers that they use them as a medicine or amulet. In some instances the sacred objects are used for profane or impious and abominable purposes. The Holy Form, ancient medals vyingly large, rare, or blurred, cotton soaked in holy oil, the Bible in English, the Ave Maria in French (we have been ocular witnesses) and other things more that for being incomprehensible and mysterious to the ignorant man are regarded by him as a genuine protection that make invulnerable whoever carries them about his person. Further on we shall deal with this subject more extensively in connection with religious festivals. Other means of obtaining from heaven signal favors are lighted candles and the more or less elaborate masses, depending on the fame of the image, the fortune of the supplicant, and the importance of the grace desired. What’s asked is not always just, good, or innocent at least. There are cases also, especially among people of rudimentary education and doubtful morality, of candles and masses offered whose purpose is the ruin or death of a hated person, of a daughter who has abandoned the paternal home against the wishes of her parents, or of the opposing side in an important lawsuit. The candles are usually of various classes according to the price and size, qualities which influence much the efficacy of the prayer. Ordinarily those that are lighted in the churches during mass do not cost more than one real fuerte  and this candle can be bought either in the sacristy or at the doors of the church where many women are stationed who are engaged in selling this article. It’s a pious and laudable act to light a candle to an image to honor it with their external manifestation of religious fervor. Far be it for us to censure it, but what we can’t accept, now or ever, is that many ascribe more power to a candle (which is sold even for a penny) than to a simple petition coming from a humble and repentant heart. Is it perchance that God does not see more than external manifestations, and like men, allow Himself to be seduced by the miserable luxury of the world or by stupid flattery? The same thing happens to masses. They are the most powerful means to which man can resort to obtain from the Divine Will what would be propitious to him. They are also of different prices according to their pomp and the candles that are lighted, whether there’s music or not, and the number of sacristans, and the like. From one to one hundred pesos, from the simple mass with a single sacristan, four candles, the simple vestments of the priest, without singing or music is of little worth in the heavenly court than what we have called the High Mass for which all the bells are rung from early morning, fireworks are lighted, and the officiating priest puts on the richest vestments, incense and lights are used profusely, and the prayers are chanted. Hence, when heaven is petitioned for the fertilizing rain, when a famous sanctuary is asked for the realization of a project, when it’s for the purpose of honoring a saint or the patron of the town, these costly masses are used in the firm hope that they will be agreeable to the eyes of the saint or the patron of the town, these costly masses are used in the firm hope that they will be will be agreeable to the eyes of the saint to whom they are dedicated. Contributing to this also is the humility of the believers who suppose that the prayer of the priest is more acceptable to God than their own, a reflection of what goes on in the world where, in order to read a superior authority, they use influential persons, courtiers, or their favorites. We have little to say on this matter which has been the same since the days of paganism. The sick who get well; those who win in lawsuits; those who go on or return from a long journey; those who deliver safely; in short, everyone who obtains what he has asked, deposit at the feet of the image or on its altar a remembrance, a memento of the event or the favor granted. The miraculous quality of the images can be known at first glance upon entering a church. The altar which is distinguished from the rest by little wax or silver figures belongs to a saint who has performed the largest number of miracles or healed the most. Among the many images of the Virgin that every temple has there will be one that excels the rest by these proofs of faith and piety and is continually lighted, while at another altar nobody prays nor remembers to light a rickety candle. This is the explanation for the fabulous wealth of certain sanctuaries while others do not even have enough with which to buy the oil to burn as the most concrete and minutest expression of worship. Frequently among the rich devotees arise silent competitions in the magnificence of their gifts. They want to attract popular attention with their piety, lavish expense, or more or less ridiculous vanity. We are going to mention here the most important in the Archipelago, the most frequented by the faithful, in the belief that with the idea that we give of this one, we shall have covered all the rest: the pilgrimage to Our Lady of Antipolo. By the first days of May when the sun begins to send off its most burning fires; when the continuous rains put a respite on their course and waters; when the people of the neighboring provinces come down to Manila to sell their goods or make purchases with their earnings of the year, the feared and venerated sanctuary of Antipolo opens to begin the long series of novenae, the thirty-six days of feasts, High Masses, the continuous coming and going, stirring, praying, amusements – thirty-six days of faith, of religious fervor, and of pilgrimage. The first Tuesday of May, the image of the Virgin, lavishly attired with rich garments, diamonds, silver staff and embroidered mantle is exhibited to the veneration of the faithful who can tell by the varying coloration of her face the state of her mind, if joy enlivens it or some irregularity irritates it. She is brown in the latter case and fair in the first. The most devoted provinces are Batangas, Manila, Pampanga, Laguna, Bulakan, Cavite, and Tayabas. However, each one has its own date for the novena and then no one can compete or equal the picturesque animation, the gay and noisy poetry of the event. On the Pasig the little boats of the pilgrims, decorated with red and white streamers, come and go with passengers peeping under the carang or cover, the heads of old and young people and children mingling with valises and dinner pails, and the music from a harp or an accordion floating in the air. Pasig, Cainta, Taytay, and Antipolo present the most varied spectacle, the most entertaining panorama that can be imagined. Some go in springy hammocks. They are the ones who, for reasons of health or for fear, cannot ride in the insignificant carromatas. Others, and they are the youth, ride on nimble little horses behind which ran their owners. Others for a vow or for lack of funds go on foot until the summit of Antipolo. Pious and merry greetings, a sigh of satisfaction, at times, a tear, are a sign that the venerable sanctuary has been sighted. Covered and full of dust of the road, wearied by the long journey, after leaving their luggage at the first free inn that they reach – here all the houses are inns – the devotees proceed to the temple to present themselves to the sacred image, give thanks, and implore her unfailing aid. With what fervor, with what faith, with what tenderness and submissiveness the simple believer enters the sanctuary to prostrate himself before the object of his pilgrimage, before the purpose of his wearisome journey! Then he prays there devoutly and he does not leave until he is soothed by faith and confidence! Inside the temple noting is heard except the monotonous recitation of the novena, the special noise made by those who go over the entire length of the edifice on their knees, the continuous going and coming of the faithful, but all done with humility and devotion. All, except the sacristans and the employees of the church, all harbor a religious fear, a profound respect, a faith perhaps exaggerated. On both sides of the silver altar burn numberless candles with little wax figures and it is no surprising to see together with the white candles of the Christians the red and large ones of the Chinese. Those who can pray, kneel down, and give all the alms they want without the necessity of being Christians or of entertaining the usual ideas about the Virgin. A large thick crowd of people elbowing and pushing, quarreling or praying, were pressing together on their way that leads to the rear of the altar to kiss the cape of the image or the hand, if the worshipper is influential or well-known. They drop their alms in the large and quadrangular box placed at the foot of the image, and so great is the piety of the faithful that this box of more than half a meter long is very often filled in less than one day. At the church’s exit are the blind, poor or beggars, who recite for you all the parts of the rosary that you wish for a little alms, just as inside they’ll say mass for you, whatever you fancy, according to the alms that you have given to the church and to those who keep it. From four o’clock in the morning, the church bells don’t stop ringing to announce masses, for so many are said that it’s impossible to count them. The people who come to hear them are innumerable, very diverse, of all social classes, and from all the provinces. A Spanish silver coin equivalent to twenty-five centavos.